The Allied Precision Heated Bird Bath is loaded with features that will bring birds into your avian sanctuary throughout the year. This generous bath creates a bevy of bathing spots for your backyard birds, and its stone color furthers the natural effect. The 20" diameter bowl offers a textured surface and contoured rim, sloping gradually to a 1.5" depth. Fully tested in sub-zero conditions, this basin will not crack in the winter cold, and the heating element is completely hidden beneath the bowl. This versatile heater uses 150 Watts of thermostatically controlled power, turning on only when the temperature nears freezing to keep the water in the bath between 40° and 50° Fahrenheit. The mounting hardware offers a wealth of placement options, enabling the bath to be situated on a wooden or metal deck rail, a wooden post, a 7.5" to 12" diameter pedestal, or even a metal pole (not included). This dynamic hardware creates a truly versatile bath, and its locking design keeps the bowl in place easily. Twist the bath off of its mount for thorough cleaning. The plastic construction forms a lasting item, and the tan hue blends with your garden perfectly. 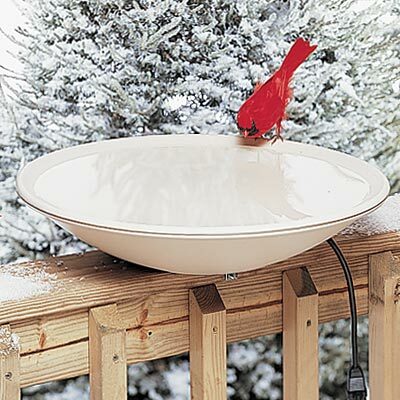 Invite birds to get a drink of water throughout the year with this Heated Bird Bath. Made in the USA. Three year warranty. Note: Please also consider the Allied Precision Heated Bird Bath with Plastic Pedestal.